With a rich palette of golden tans through to medium red-browns and small touches of violet shades, Cumaru cladding can feature a number stunning contrasts across one project. Bennetts cannot offer colour uniformity with Cumaru, however its rich, deep tones can make for a stunning look. Cumaru cladding is naturally resistant to rot, insect attack, mould, fungus and decay. It is also highly durable and strong, and requires little maintenance and no treatment prior to installation. Its high strength makes Cumaru less likely to bow, crack or warp. It is classed as very durable. 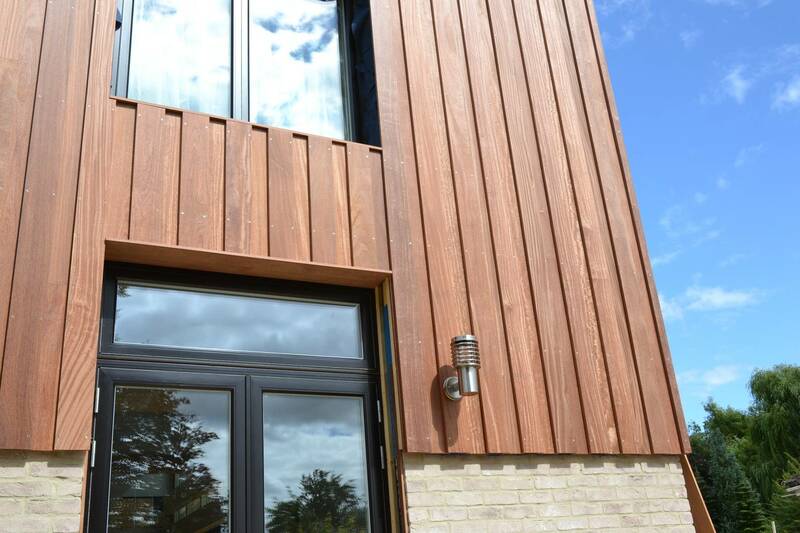 Cumaru, also known as Brazillian Teak, is a relatively new species to the UK, however architects and quantity surveyors are starting to specify Cumaru for large hardwood cladding projects because of its look, durability and life span. There have been previous concerns about the legitimacy and sustainability of tropical hardwoods, however, all the Cumaru that Bennetts Timber supplies is FSC® Certificated. Cumaru timber has been used widely in Europe and North America for a long time, and was used for the decking on the boardwalk in Atlantic City where it has lasted for 70 years so far without being replaced. As a tropical hardwood, it is extremely durable and hardwearing. Bennetts kiln dried (KD) Cumaru maintains a dry moisture level of approximately 7-10%, with an above ground service life of around 30 years. Cumaru cladding will weather into an attractive silver-grey colour over time. The period of time this takes and the extent to which it changes colour is highly variable depending on exposure to outside elements, with each project using cumaru cladding looking different from the last. If preferred, fading can be avoided by applying a clear treatment with a UV filter. If initially treated, the Cumaru will need re-protecting in a few years’ time. Alternatively, it can be stained to maintain its rich colours. Staining and other preservative treatment can be factory applied by us, so just ask or see our Painted Cladding section. Ex stock: 25x100. Call us for availability on 01472 350 151. Bennetts Timber stocks and supplies FSC or PEFC certified timber, all from well-managed forests. If you are considering using Cumaru cladding as a material and need further assistance, do not hesitate to call our sales team on 01472 350151 who will be happy to help with your questions.